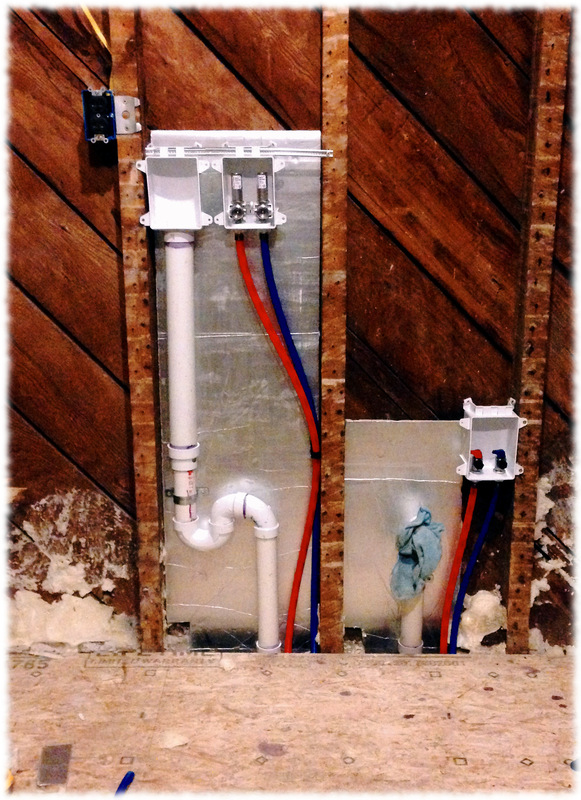 I was able to make more progress in the mudroom/laundry room today. 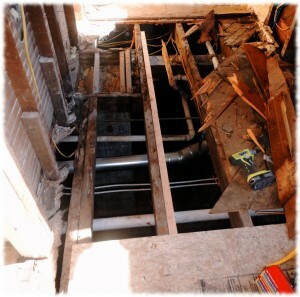 Picture of the joists with the subfloor removed. I sistered the joist in the center, and repaired the mess on the left side. First I removed the flooring. All four layers. 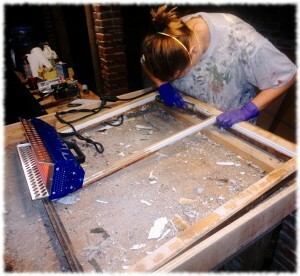 The top two layers (plywood and linoleum) went into the trash. The next layer (original flooring) and the subflooring went into the fire pit. Even the boys helped by removing debris. Not that they volunteered, but they didn’t complain too much either. Next I repaired two damaged joists. The two joists that had been next to the chimney had suffered from some water damage. I removed the framing that had gone around the chimney and added a sister joist to both of the rotted joists. I cleaned up the remnants of the old flooring and added a new subfloor. 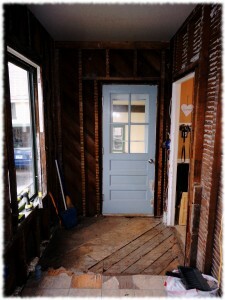 Now to decide if I like where the new floor will line up with the door thresholds. I may add another 1/4″ subfloor, but haven’t decided yet. 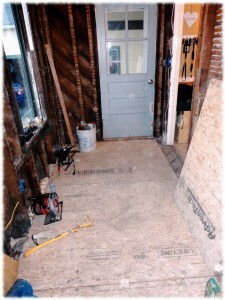 mud room with new subfloor installed. I’ve made it writing for over 4 years in this blog. I have 396 posts (397 with this post) and 113,000+ words and nearly 700 pictures in the blog. The blog takes 800MB of disk space. While that may not be a great number of words or posts as far as blogging goes, for me it is an accomplishment. I have too much of a tendency to like shiny new objects and get bored with old projects. However, forcing myself to sit down and reflect is a good exercise. It helps me keep focused (as focused as I’ll ever be) – though if you looked through old posts, I’m sure you would find it pretty random and wonder if I could ever find focus at all. Anyway, here is to focusing (sort of) for the next four years. Broken frame and upper jamb after removing the trim. We had to remove the trim around all the doors and windows so we could tear down all the plaster and lath in the mud room/laundry room. We are replacing the plaster with drywall. Apparently I wasn’t careful enough removing the trim around the window in the laundry room, and the window frame came apart when I pulled off the trim. 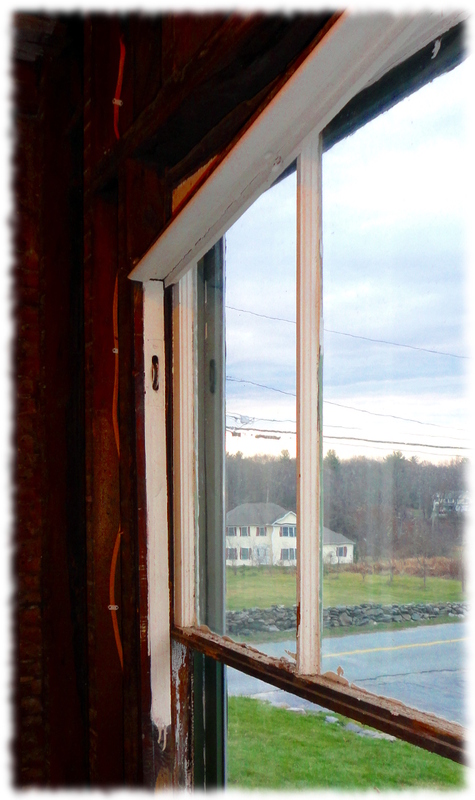 These are original double hung windows. 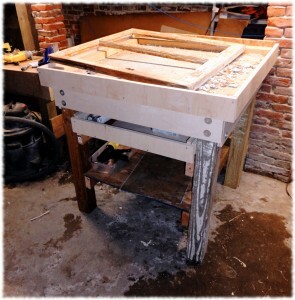 The frame had come apart where the wood was thin – the dado where the parting bead was installed. We decided to glue the frame back together instead of trying to duplicate the piece in the workshop. I also had to repair the upper jamb which also broke in half. 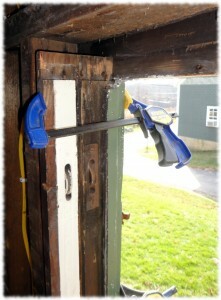 To clamp the frame up, I needed to take the storm window out. That would mean the house needs to be open to the outside for a couple of hours, or I would have to install a plastic sheet on the exterior to cover the window. However, today the temperatures soared into the upper 50s and the sun was out. No problem leaving the storm window out for a couple of hours. First I removed the upper sash. It was really stuck, and I cracked one pane of glass getting it out. Then I removed the upper jamb and pulled the nails out. I used some thick epoxy to do the repair. 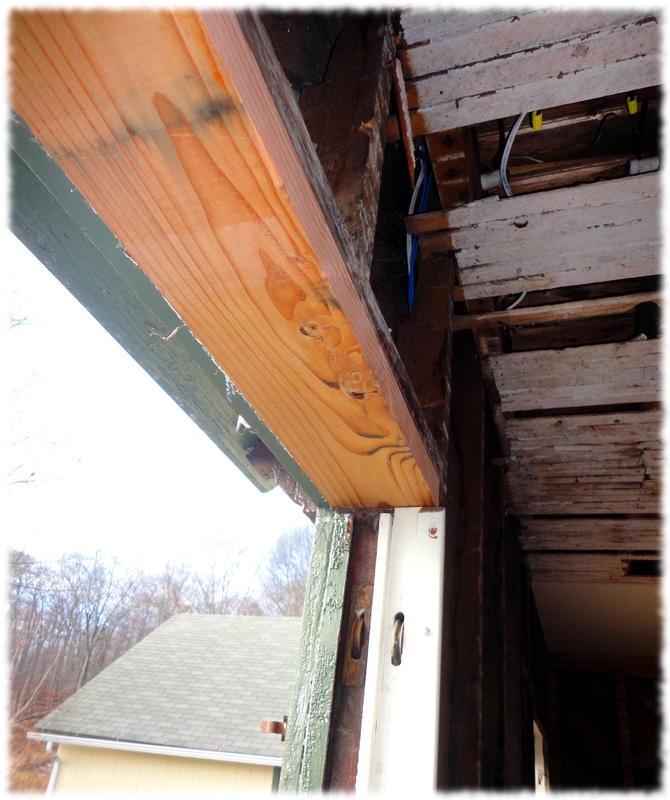 I replaced the upper jamb with a piece of 2×8 framing lumber that I cut down to size. 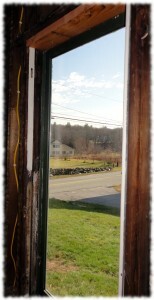 Once the epoxy had cured enough to no longer need clamps, I reinstalled the storm window. 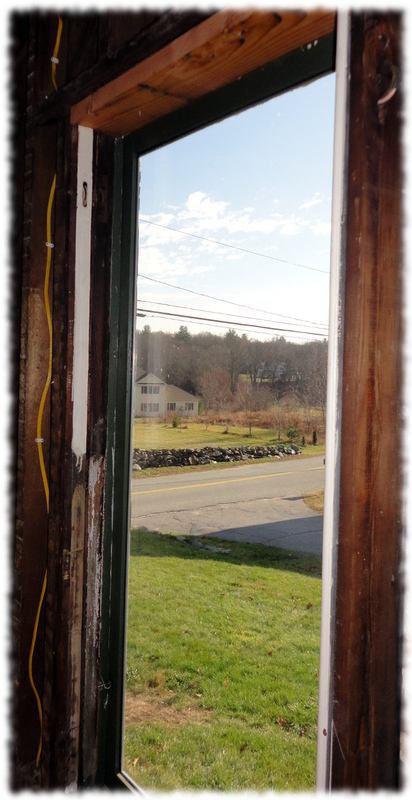 Now to scrape the paint off and wait for Susanna to finish the window sashes. The window frame glued and clamped up. Full window frame glued up. New upper jamb installed, glued in with construction adhesive and a couple of screws. The original had a dado for a parting bead. I’ll just make a small bead and glue it into place. Window repaired with the storm window reinstalled. We still need to scrap and repaint the frame. Susanna and I have been working on renovating the mud room/laundry room space. It is a pretty big project, but we are making progress. 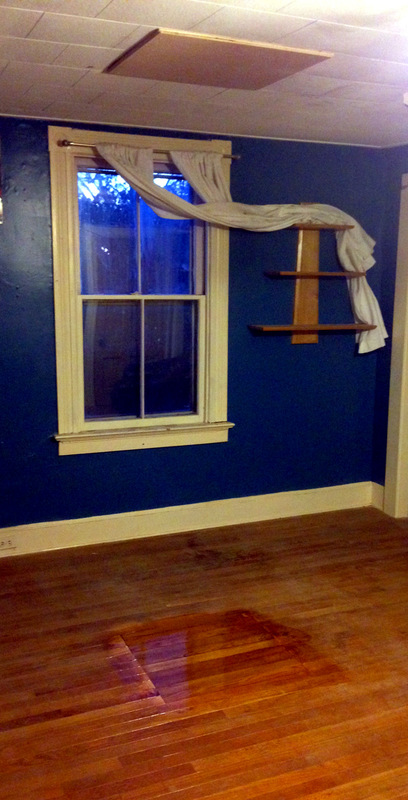 The room has two windows, and one of the windows has a broken pane. 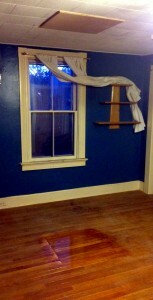 I have renovated old windows in the past. I’m not good at it and I don’t really enjoy it. 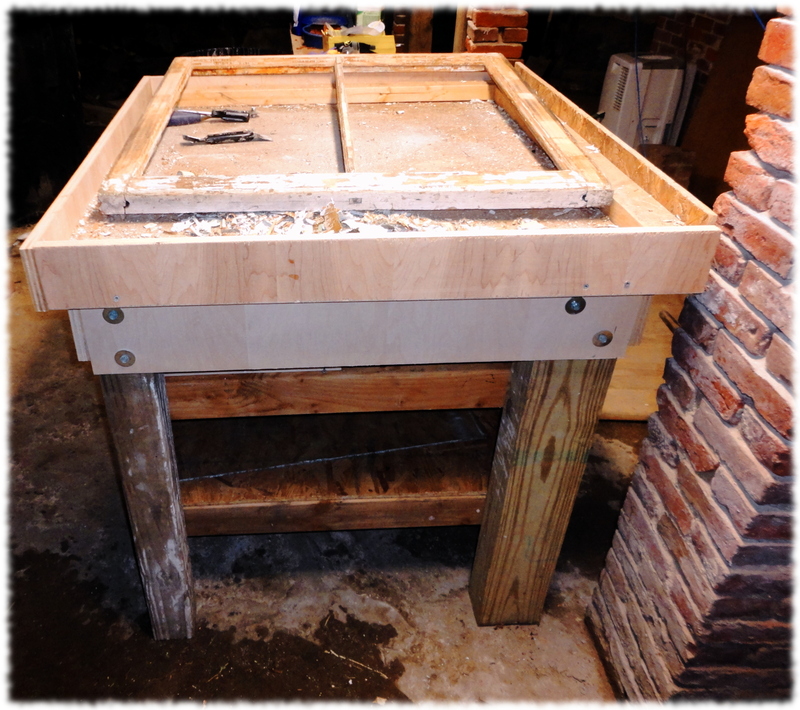 It is detail work, and the workbench isn’t quite the right size for it. So typically I work on a pair of saw horses in the basement. Again, not ideal. 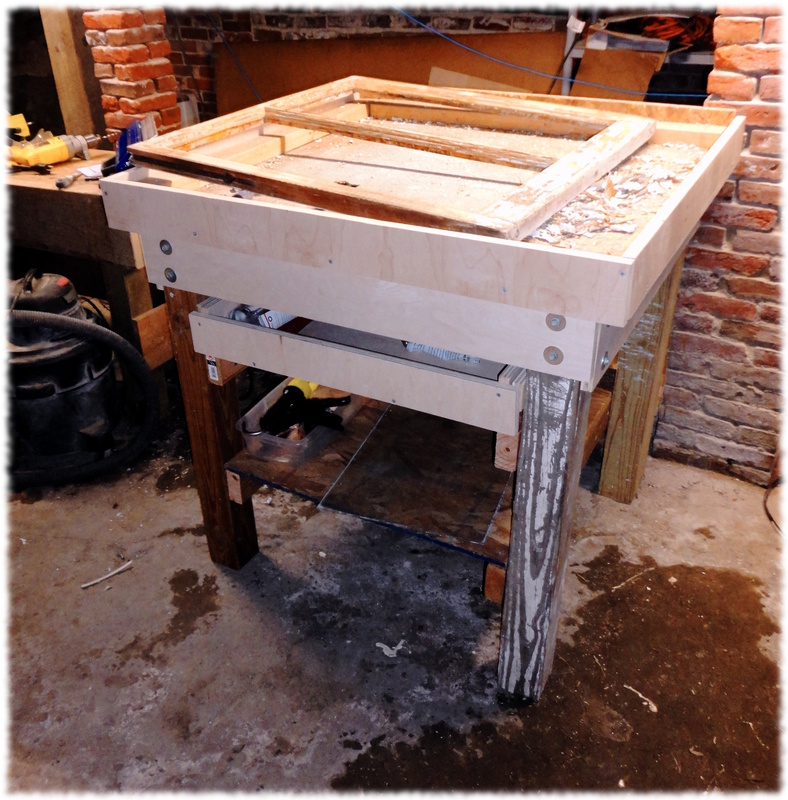 Workbench for repairing the antique windows. Susanna decided to tackle the windows. Of course I’m hoping that she will find it more enjoyable than I did and keep going when she is done with the four sashes in the laundry room. To make the project easier, I decided to make a workbench dedicated to repairing the windows. The bench height is a little taller than my woodworking bench so you can see what you are doing without bending over too much. I made the top a couple of inches larger than the window sash size, and added a lip all around. The lip allows you to push on the window from any side and keeps the mess contained. I also added a shelf (place to store glass and tools) and a drawer. The bench was made from scrap lumber that I had around the shop, and used hardware that I already had. I made the bench in a couple of hours last weekend, and as you can see, Susanna has already stripped one of the lower window sashes. She has been using an infra-red paint removal tool, the silent paint remover, to help remove the old paint and putty. I’ll detail the process in a later post (if I get around to it). Side view of workbench. The rear legs are from a 4×6 post I had – the bench is very solid.